Noticeably improves the appearance of stretch marks on thighs, buttocks, abdomen and chest. Effective on mature as well as new stretch marks. Experience minimal downtime and return to your busy lifestyle. Feel confident and wear what you want. The Lumenis® Photofractional™ treatment works with your skin to stimulate deep collagen regeneration over a sequence of treatments. 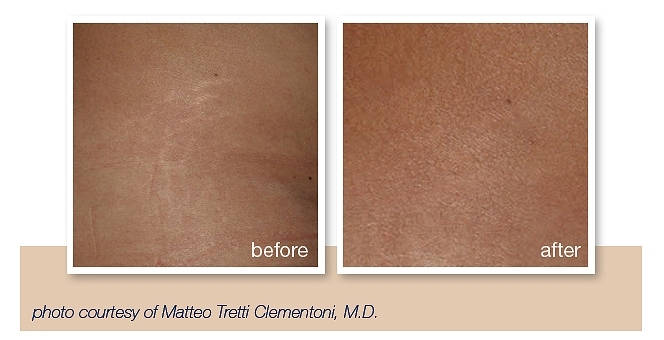 The result is a visible smoothening of the affected stretch mark area and an improvement in the discoloration. Already after the first session, you may begin to notice improvement. Typically, 3-5 sessions in 2-6 weeks intervals are needed to obtain optimal results. However, you may continue to see improvements for up to six months following the treatment. Immediately following treatment, you may experience some redness or swelling, depending on your customized treatment settings. The swelling will usually diminish after a few hours and the redness as quickly as the next day or over the next few days. Most patients are able to resume their daily activities the very same day. Typically your physician should advise to stay out of direct sun for a few days following the treatment and to apply sun screen. 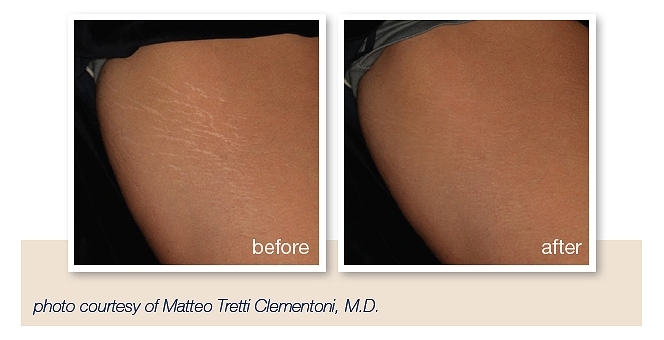 The Lumenis® Photofractional™ treatment is a non-invasive method for improving the appearance of stretch marks on different areas of your body. Our unique technology includes two solutions, IPL (Intense Pulsed Light) and ResurFX™ nonablative skin resurfacing, so that both skin tone and texture can be treated at the same session. Lumenis® energy-based treatments are not suitable for everyone and carry some risks. Photofractional™ is not suitable when you have active infections, viral, fungal or bacterial diseases, inflammatory skin conditions or skin cancer. Risks may include: redness, swelling, change of pigmentation and scarring. Be sure to consult with your treatment provider before choosing this treatment. By using both IPL and ResurFX™ technologies, both skin pigmentation and texture can be treated at the same session. Lumenis® IPL technology removes unwanted pigment from the skin, while the ResurFX™ fractional laser stimulates the production of new collagen and elastin fibers in the deeper layers of the skin. Stimulating new collagen production is the key to a smoother looking skin.